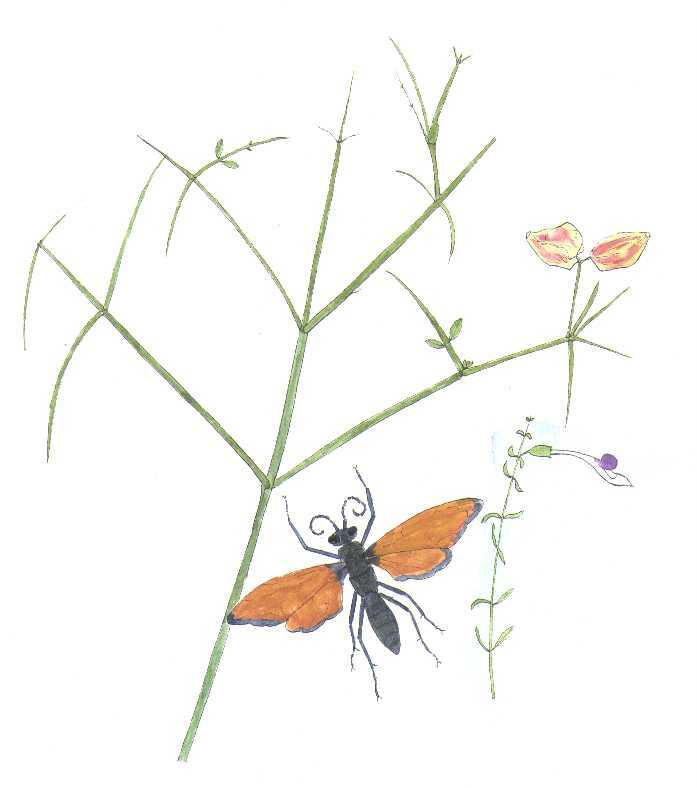 This watercolor illustration was done from a specimen found near Castle Hot Springs, Arizona. Oct. 1992. The wasp is a male tarantula hawk; a large number such males were found visiting this plant in the Big Horn Mountains, Arizona. 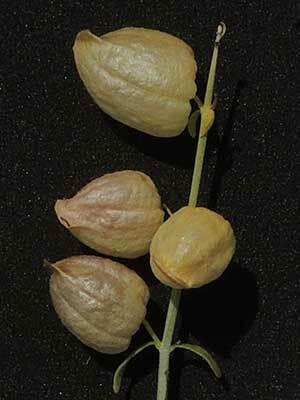 FRUIT: A wispy, papery, vase-shaped sack forms from the enlarged calyx. It is tinged with burgundy and quite attractive. This is an adaption for dispersal of the seeds by wind. The fruit below were seen at Bartlett Dam Road, Maricopa Co., Arizona. May 2017. SHRUB: A small to medium sized shrub with smooth, green and photosynthetic bark. Paired branches are disposed at alternating right angles. Usually less than 1.5 m tall with the weak branches often supported by other plants. LEAVES: Readily drought deciduous, small, opposite, elliptic. Often LEAFLESS. FLOWERS: Strongly two-lipped, vivid purple and white. ARMED: The ends of twigs are drawn out into weak spines. RANGE: Common in the washes of western Arizona mountains (Kofa, Eagletail, Big Horn), but also occurs sporadically towards the east as far as north of Phoenix.